Most likely off ice shelf winds. As the image from nullschool.net shows. Image from nullschool.net. The colours are air temperature, the lines the wind direction. The green circle is the location for which the temperature and wind velocity are shown. -18.9C and 17 km/h. So I believe a sustained period of off ice shelf winds has pushed the pack ice north and away from the ice shelf. 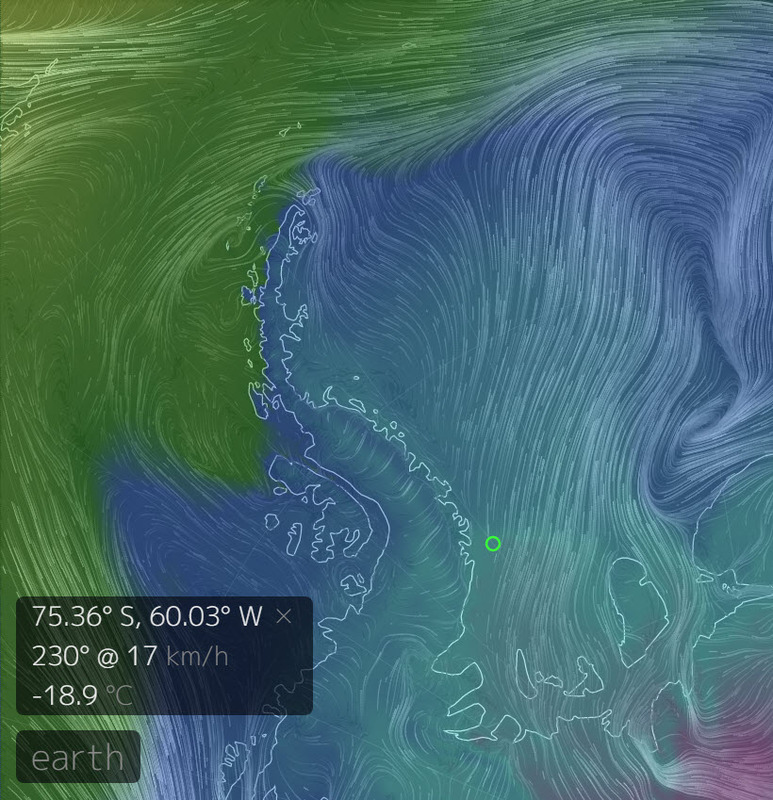 If you look at my sea ice extent gif from my previous post The Amundsen Sea is practically sea ice free, you can see the polynya opening up at the end of the sequence. Here it is in the data from 16 February 2017. The Antarctic sea ice extent 17 February 2017. Data from DMSP SMMI. 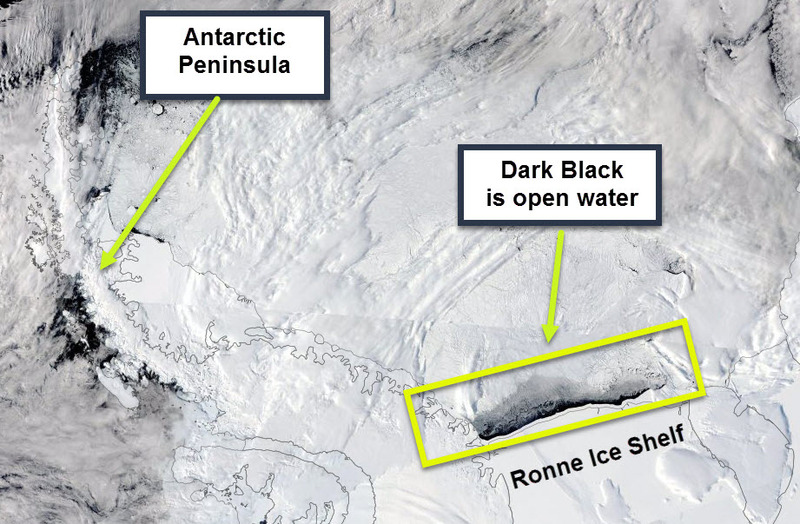 The Ronne polynya is common and there was an experiment a long time ago called ROPEX (RONNE POLYNYA EXPERIMENT) that was designed to study it. From that experiment there are a couple of lovely papers from Dr Emma Fiedler (University of East Anglia) on the heat flux. 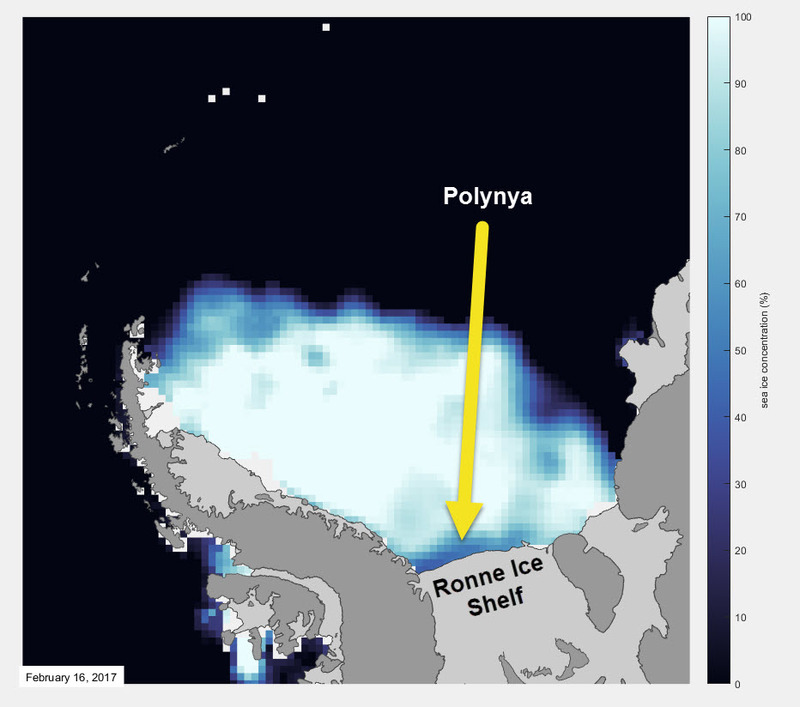 She published data showing heat fluxes over the polynya were ~150 Wm-2 for the fetches of ~100 km seen in the images above (Fiedler, Emma K. "Ocean‐atmosphere heat fluxes at the Ronne Polynya, Antarctica." Weather 65.1 (2010): 16-21, also her PhD thesis - Air-sea-ice interactions at the Ronne Polynya - is online as well. So 150 Wm-2 x 27,000 km2 is ~4 Mega watts of heat being lost from the ocean. In her thesis Emma works out ice growth rates and salt rejection contribution too. I may look at that over the weekend.